When I was checking out some of the recent entries for the Oracle-D State of the DApps task, I noticed that some people were not exactly following the guidelines that are explained in Oracle-D's general guidelines video. It's really in your best interest to adhere to those guidelines as best as possible, since doing so will greatly improve your chances to get a high rating from the Oracle-D reviewers. While I'm not exactly an authority on the Oracle-D platform, I have won their previous task, which was sponsored by State of the DApps. Keep in mind that I had never even participated with an Oracle-D writing task before. The main advantage that I had over other competitors, was that I had watched the Oracle-D guidelines video around 3 times in a row. I think that I know fairly well what Oracle-D is looking for when they review writing task entries and it's really not that hard to adjust your writing to have a better chance at getting a positive review. Paying close attention to the keywords you use within your article and especially in links is absolutely necessary. Oracle-D has guidelines about the use of keywords in each task. You should really try to incorporate those keywords as naturally as possible, in a way that doesn't make them stand out among the rest of your content. You've probably come across the term long tail keywords in some of the Oracle-D tasks. These are specific sets of keywords that are grouped together, for which people are looking for when they use search engines. You should always try to use these long tail keywords for links. Again, you want to use them in a way, so they don't disrupt the flow of your article. Mind you, this isn't perfect, there's still some room for improvement. The links could have been a bit shorter and they could have focused more on high-quality keywords. I am pretty happy with how I've incorporated that last link into the story, that specific sentence was in the task requirements. Also keep in mind that you should use keywords sparsely, most search engines notice when you spam certain keywords throughout your article. Make sure that you try to incorporate important keywords in your main title, subtitles (headers) & links! Correctly tagging and naming your images is a must. The website or service you're writing about will see great benefits if you always give your images an appropriate title and alt text, again, pay close attention to the keywords you're using. Sometimes, it might be a good idea to also put a subtext under an image. In the case of my latest entry for the most recent State of the DApps task, I opted to include a screenshot from the State of the DApps website and accompany that screenshot with an appropriate subtext. As you can see, you can easily add a subtext by using the HTML element <sub>. I personally use the free & open-source application ShareX to take precise screenshots of websites or other applications. This screenshot tool allows me to quickly edit, add image effects & rename images. All screenshots in this article were made with ShareX. This is one mistake I see many people make. 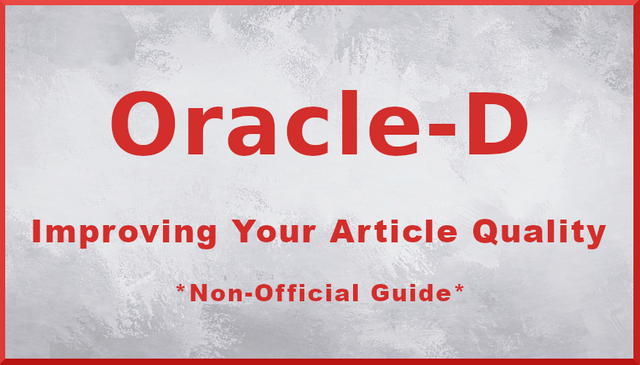 The Oracle-D guidelines video clearly states that you should not mention Oracle-D or other projects in your articles. I'm sure there are a couple exceptions to this rule, with the State of the DApps tasks, it's basically necessary to mention other projects in your articles. Though, you should really never mention Oracle-D in your articles! The goal is to write articles as you would normally write them. When you're putting references to Oracle-D in your articles, they lose their value as real content, made by real people. Then it just becomes clear that they're just promotional essays to earn the author money, you really want to avoid that. Let the project you're promoting be the hero of your article! Make sure that you're writing, because your passionate about their project, not because you want to earn a quick buck. This concept is explained pretty decently in the Oracle-D guidelines video(linked to correct timestamp). You basically only want to write in an authoritatively writing-style when you're absolutely certain that you know the subject well enough AND if you have an excellent grasp of the English language. Using a personal writing style gives you a bit more leeway in terms of grammar and sentence structure. I generally find it to be much easier to write in a more personal style, just because you're able to form a better connection with your readers. If you're not a native English speaker, I would really suggest using a personal writing style, just because you'll probably find it easier to construct proper sentences. Protip - Always capitalize your I's. I've seen many people who do not do this and it makes your articles look extremely unprofessional. Try to end your blogs with an enticing call to action. You want your readers to perform a certain task after having read your article, whether it's visiting a website or engaging with the organization they've written about. An excellent call to action should make your readers want to take the next step. Disclaimers should only be used if you're giving out legal or investment advice in your blog posts. I always find it a bit weird when I'm seeing disclaimers on articles that really don't need a disclaimer. You might think 'better safe than sorry', but it doesn't look good when you're over-using disclaimers. Do use them when needed, but don't overdo it! Really try to put yourself into the Oracle-D customer's mind and think about what they as a customer would want. They have no need for low-quality articles, written by people who are just writing to earn a reward. They want honest coverage and content written by real people, with real thoughts. It's not bad to be critical, as long as you're presenting it in a constructive way. Learn more about SEO optimization, while still being true to yourself. Both your readers and the Oracle-D client will thank you for it. Visit the Oracle-D website, to see how they're building communities using blockchain technology! Hello @daan, thank you so much for this great article. Last time was the first time I joined the Oracle d task. I have made a lot of mistakes and now I need to go back and correct them. Really appreciate this needed info. And you've won that one as well, right? I'd say you've done pretty well, the odd mistake here and there isn't too bad. Great article! I haven’t joined yet oracle d tasks but thanks to you I will do it ASAP. Do give it a try, you can get some decent rewards through oracle-D! It is always better to get the homework done before getting into the battle field. The rush to win the prizes makes people thrive to see the end result without looking at the need of the tasks. Thanks for putting everything in short to make people focus more. Very nice write up and well deserving of the generous upvote! Great job @daan! I know you were a definite help to me on my first task! Your UA account score is currently 4.131 which ranks you at #3282 across all Steem accounts. Your rank has improved 12 places in the last three days (old rank 3294). In our last Algorithmic Curation Round, consisting of 212 contributions, your post is ranked at #70. What a great guide, with all kinds of useful information. I haven't tried an oracle-d contest yet, but after reading your guide, I think I will. I've written mostly fiction stories, but there a lot of great dapps on Steem that need promoted. Thanks for the assistance!